The Pepper Turkey Farm along Route 9 in Wilton was a landmark business in northern New York until it suddenly ceased operation on a Friday night in 1971 as they geared up for the Christmas rush. “The famous Don Pepper Farm is dead,” a recorded voice told people who thereafter phoned the farm. Speaking was Dorothy Pepper Bull, wife of the late Don Pepper. She and their sons Don, Jr. and John kept the farm going after Don Sr.’s death. It stood in part on land that is now home to SUNY Adirondack’s Wilton campus. “Donald H. Pepper, the original proprietor, gave his life to building a business and a product of which he was very proud,” said Dorothy in the recording. “This business was successful for 35 years and it took one for New York State Department of Agriculture officials to make it necessary for me to make my decision to close our modern dressing plant. This happened December 16, 1971. Late 1950s — Don Pepper, Sr., is second from the left. Photo provided by the Pepper family. The low red turkey barns were a landmark on the east side of Route 9 in Wilton. SUNY Adirondack occupies a piece of the property now. Photo courtesy the Peppers. What the Peppers and perhaps other small operators didn’t realize is the New York officials were enforcing a federal law that doomed producers like the Peppers. On June 13 the House approved it 351-15. On July 29 the Senate okayed it 73-0. On Aug. 18, the president signed it into law. But delving into the record of the legislation — which I did in the late 1970s sponsored by my constitutional law professor at the University of Maryland School of Law — most of the testimony supporting passage of the law wasn’t selfless. It came from advocates of Big Business and Big Labor. Frank Frazier, executive vice president of the National Broiler Council, represented automated poultry plants that he said used “palletized coop handling; automatic killing; giblet pumping, skinning, and wrapping systems; continuous chilling systems; automatic sizing and weighing; automatic icing; automatic box closing; palletized and motorized handling of the finished porducts; and sanitary overhead conveyor systems.” Poultry left the plant virtually untouched by human hands. The Peppers did their work by hand, one bird at a time. 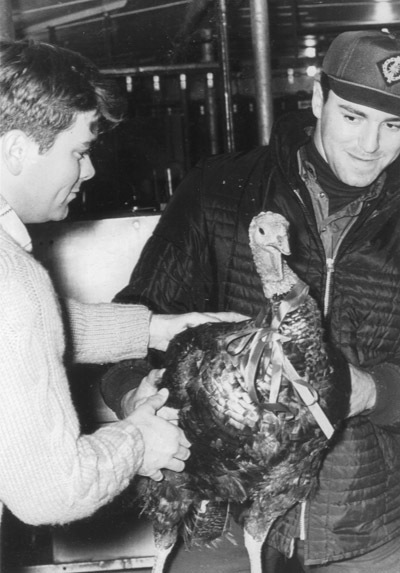 Brothers Don Pepper, Jr. and John with a Pepper’s Pride Turkey. Don Sr. and his wife Dorothy started the farm in 1937. Don died in 1956. His wife and sons continued it. The Peppers might handle 45,000 turkeys a year. The big, year-round poultry plants were much more likely to be unionized. At holiday time, the Peppers employed part-time high school students, like “Jungle” Jim Mosher, who with his wife Becky owns Harris Grocery in Lake Luzerne and contacted me after a previous story. He remembers his time at the Pepper Farm fondly. The call from industry and labor officials and from consumer advocates was for “uniformity” — the same practices enforced on every producer. What it meant in practical terms is that a plant that might process 45,000 birds a year had to buy the same equipment as one that processed birds a day. The Peppers quick chilled their slaughtered turkeys in a vat of ice water. Now they’d need a much more expensive automated chiller. 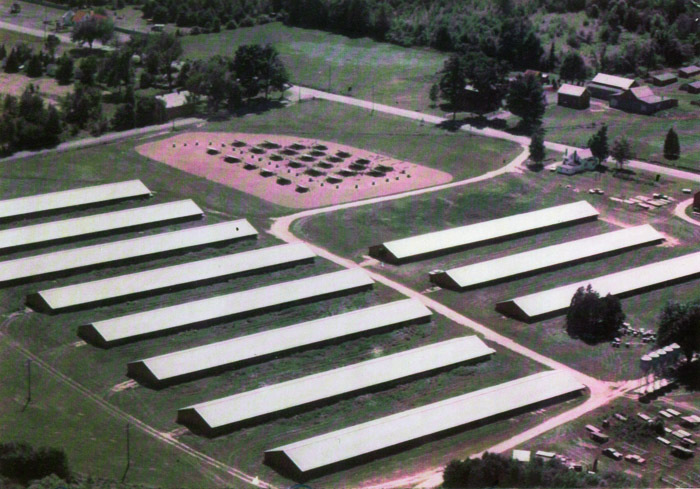 Up to and even after World War II, chicken farms were small and nearby. Then in 1957, a federal law was enacted standardizing poultry inspection and packaging requirements. It transformed America. Within 10 years, by 1967, 85 to 87 percent of chickens and 94 percent of turkeys were federally inspected — and prices fell, too, from an average 51 cents a pound in 1957 to 41.3 cents in 1967. Herding turkeys — Don Pepper, Jr. is with five-year-old daughter Dottie — who grew up to be a famous professional golfer and now golf commentator on TV. 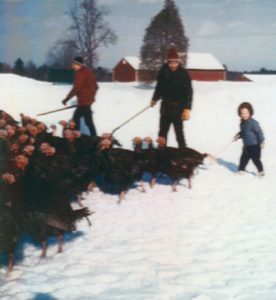 Don’s wife Lynn, who shared these family photos with The Chronicle, said the turkeys were herded across U.S. Route 9, from the pole barns on the east side of the road to the processing plant on the west side. But the 1957 law exempted the little guys like the Peppers. Very few of them made it to Washington to testify when Congress considered the Poultry Products Act of 1968. Albert J. Russo was the rare one who did. He testified on his own behalf and as president of the Northeastern Poultry Products Council (NEPPCO). “I reside in Hope Valley, R.I., where I am engaged with my father and two brothers in the operation of Chickadee Farms, Inc. We have a flock of 40,000 laying hens producing table eggs, a large flock of breeder hens producing hatching eggs and raise several thousand broilers, capons and turkeys each year…. “However, we have a small plant compared to our inspected competitors. Most weeks of the year, we slaughter less than 2,000 birds. The majority of NEPPCO’s turkey grower members raised less than 15,000 birds a year and slaughter most of them in the last 3 or 4 months of the year. “Obviously their dressing facilities are quite small. Must of the slaughtering is done in the evenings and over weekends…and a lot of the work is done by hand…. He said his poultry sold for 20 cents a pound more than the chainstore average. Another small operator — Lawrence Dean of Dean’s Turkey Farm in Morrice, Michigan — asked to put into the record an article from National Turkey News. The small farmer Mr. Russo got a hostile reception. “From the health department?” asked Rep. Myers. “He would not be in business very long,” replied the farmer Mr. Russo. And how good is the inspection anyway at these highly automated USDA plants? The rare person to ask that question of the Congress was Dr. Oscar Sussman, senior meat instructor in meat inspection at Rutgers University in New Jersey. Dr. Sussman said, “Mr. Chairman, I worked on a poultry inspection line. I have worked in a hog slaughterhouse. Dr. Sussman testified, but the Representatives asked him no questions. The law passed. Three years later, on a Friday night in December, the hammer came down on the Pepper Turkey Farm as it did on similar sized poultry farms. Periodic salmonella outbreaks and other issues arise in poultry and other federally inspected products. And supporting the little guy to a certain degree is back in vogue. Much too late for the Peppers. 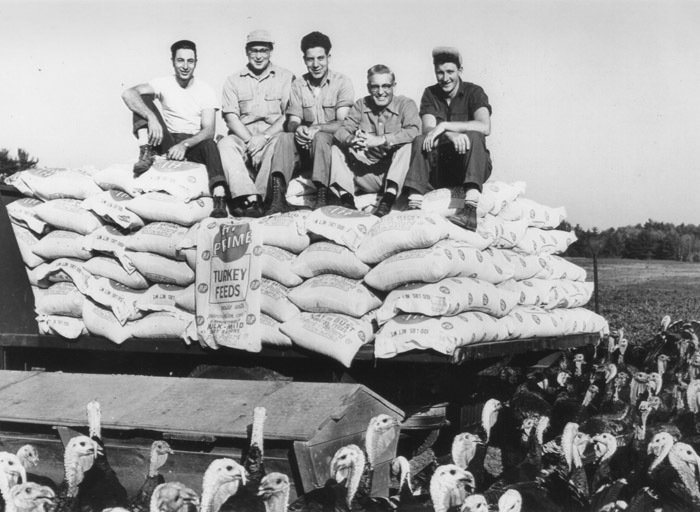 A half-century later I still miss the Pepper Turkey Farm, and see its fate as cautionary. There’s no safety for the little guy in simply minding your own business when Big Government, Big Business and Big Labor join forces far away to drastically change the rules of the game.